“Use Google Drive as a “Stepping Stone” to 3D Learning” by Jennifer Funk first appeared on the Edcetera blog. Craig Roberts, assistant director of education at the Duke Institute for Brain Sciences, believes his students learn better when they explain things visually. So, he has them build fruit fly brains out of Play-Doh, and construct human brain cells out of miscellany from The Scrap Exchange, a local nonprofit creative reuse center. More often, he sends them to the whiteboard to illustrate core concepts using a splash of color and lots of lines. These strategies work, says Dr. Roberts, because when students are forced to communicate in visual or spatial language, they’re able to root out each others’ misunderstandings early. But there are limitations to the whiteboard method, in particular. Only one student is designated the illustrator, for example, and while that student faces the whiteboard, the others are bent over their books pulling out information to advise the illustrator. It’s a rather disconnected way to go about group work. So, Roberts and his collaborator, David Wilson, devised an experiment where they asked students to do the same visual representations of learning they always have, but to do them in 2D and 3D online environments. Roberts wanted to know: Would learning gains be greater in these high-tech environments? And, if so, which one was better? What he discovered offers new insight into the future of online learning, as well as some best practices for using Google Drive (the 2D environment) in the classroom. 2D VS. 3D LEARNING: WHICH IS BETTER? For the experiment, students worked in small groups to construct visual representations of findings from research articles they were studying in Neurobiology of Learning and Memory. 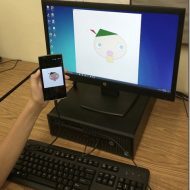 For three weeks they worked in a 2D environment using Google Drive’s drawing function (fig. 1) followed by three more weeks in a 3D environment called Open Cobalt (fig. 2). Throughout, students were given both subjective and objective learning assessments. Interestingly, while students self-reported greater satisfaction with the 2D environment, objective test results showed the 3D environment yielded greater learning gains. Roberts attributes this to the fact that students operated more comfortably in the 2D environment, which led them to believe they were learning more. It was the 3D environment, however, that revealed much promise for the future of online learning. But for now, says Roberts, it’s just that — the future. Despite the results of his experiment, he recommends instructors wait to use 3D software until a robust and user-friendly platform is available. (Open Cobalt was still in development.) Until then, he recommends instructors become competent using Google Drive, a stepping stone of sorts to the 3D environment and a solid learning tool in its own right. Google Drive (formally Google Docs) is a cloud-based space to create, edit, share and store documents. What makes it particularly useful for learning is the feature that allows users to edit the same document simultaneously, as Roberts’ students did. Set-up is simple and you can find detailed explanations of it here and here. Roberts advises the following best practices. While his experience is specific to creating visual representations, these practices apply no matter the specific learning goal. Rule #1: Have students work from the same physical location. It’s critical that students work in a face-to-face environment even if it is also online. This way, students can edit the same document while also conducting real-time, meaningful discussions about learning concepts and the best way to represent them. Roberts gives students individual laptops and directs them to sit with their teams as they work in Google Drive (fig. 3). Rule #2: Keep teams together. Whether you select the teams or they they do, students become really effective team members only after the third or fourth time they work together. “They get to know each others’ strengths and weaknesses and we see a real jump in their performance,” he says. Rule #3: Repetition. Repetition. Repetition. It’s natural to resist attempting again a project that didn’t work the first time. Still, for something like Google Drive (or any other new tech tool), it’s important to keep exposing students to the environment. Although Roberts said most of his students were already familiar with Google Drive, it took them a couple opportunities to get re-acquainted and to feel comfortable with his specific assignments. If you’ve used Google Drive in the classroom, what best practices would you add?